The ammunition manufacturing industry in the United States effectively said it is going to abandon California hunters, help reduce hunter opportunity and sound wildlife management, and assist in driving more hunters from the sport. This will make it much easier for the anti-hunters in this state to accomplish their goal and simply ban hunting entirely. The anti-hunters have more influence in Sacramento politics than the hunting community. It was the pressure from those anti-hunters that pushed the California legislature to ban the use of lead ammunition for hunting (AB 711) by 2019. The antis were able to convince the liberal legislature, which is profoundly anti-gun, that lead ammunition shot by hunters was a danger to the state’s wildlife resources. It doesn’t matter that is a profound lie. With an emasculated Department of Fish and Wildlife that was muzzled from refuting those claims and a pro-hunting lobby that is largely ignored in Sacramento, the legislation passed easily. This was unprecedented because the agency (or director) never offers its advice or scientific opinion on bills publicly, only behind the scenes and only when asked to do so. These are governor’s orders, and it has pretty much always been that way. Director Chuck Bonham received a lot of flack from the hunting community by supporting the lead-ban legislation. We expected it was going to pass, but he assured that it would pass since it had DFW support. I was one of those who hammered hard on him for that move. You and I might argue that the director and his staff should have simply pointed out the biological flaws in the legislation and urged legislators to not pass the bill, which may have halted the legislation. But in the DFW’s political world, they would argue the director and his staff worked to assure that the ban wouldn’t be implemented immediately for this fall’s hunting seasons. And they assured that if the alternatives to lead were banned, we could go back to traditional ammunition. Both of these moves addressed the issue of ammunition availability for hunters and saved hunter opportunity, at least in the short term, in their eyes. If implemented immediately, there was no way the ammunition pipeline could be filled with non-lead ammunition needed statewide, and many hunters would simply be forced to stay home. The anti-hunting groups know this and are still pressuring the Fish and Game Commission to push implementation of the legislation up to 2015. The DFW staff, concerned about what that would do to hunting participation, game management, and wildlife funding, is recommending that implementation — for most species — is pushed right up until the 2019 season in hopes that the ammunition companies would see and fill the California need. That brings us up to this week. On Monday, the National Shooting Sports Foundation released a study it commissioned called, ìEffects of the Ban on Traditional Ammunition for Hunting in California Participation and Associated Economic Measures.î The data was compiled by the respected Southwick Associates, which specializes in fish and wildlife statistics and economics. [This report is available at this direct link: http://nssf.org/share/PDF/CA-Alternative-Ammo-Impacts_9-15-2014.pdf]. My first reaction to the data compiled by Southwick was more anger at the California legislature: Cost of non-lead ammunition will be from 300 to 400 percent higher than lead ammunition used for hunt=ing. The California demand for non-lead ammunition will exceed current production of non-lead rimfire ammunition by about four times, and our increase in demand for shotshell and rifle ammunition will make all of those products even harder to get. It will run a minimum of 13 percent of California hunters out of the sport and the number could be double that. It will cost the DFW at least $1 million in lost federal revenue and that doesn’t count lost license and tag sales. So, yes, there is a lot to be angry about with our legislature. But the more I looked at the data and read the details of the report, this emerged: Because of current demand, the companies simply won’t be able to meet the new California need for non-lead ammunition. In fact, the companies say it would be a bad economic investment to expand production. Anyone who is a shooter or hunter knows that ammunition has been scarce for several years. Virtually all of the nation’s makers are running plants seven days a week 24-hours a day to try and keep up with demand in just the sporting market. Yet, they have all been reluctant to expand production capability in a significant way because they fear this is a panic-driven boom in sales. Using the NSSF report, and based on the increase in costs for non-lead ammunition it reports, the value of the added non-lead market in California is $91 million a year ($61 million in centerfire ammunition, $24 million for shotshell, and nearly $6 million in rimfire). That is $10 million more than the $81 million value of the nationwide non-lead shotshell marketplace, and this is a highly competitive market battled over by the makers. But they are unwilling to invest in any new production capability to serve California hunters and a $91 million market? They have a guaranteed $90-plus million market in California! Our DFW made sure they have five years to ramp up production to meet the new sales demand. Besides, there are political moves across the nation to push non-lead ammunition for all types of hunting. It’s not just a California thing. The military is moving toward a ìgreenî military ammunition. Investing in non-lead ammunition production is hardly a bad idea. So does the ammo makers’ excuse sound disingenuous to you? I can understand the makers being reluctant to expand with the current and uncertain boom (although many observers who do the gun sales math say the current ammo boom is really more likely a ìnew normalî because there are so many new shooters who have entered the sport in the past decade). The California need is new and guaranteed. We all know there is zero chance the law will be changed back, even if we find out condors don’t get any lead from ammunition. That is reality. Like it or not, non-lead ammunition is a growing marketplace, but the politics within the ammunition companies are as ignorant and hard-headed as the politics in Sacramento. By saying they can’t (or more accurately, won’t) meet the California demand, the ammo makers somehow think they are getting back at California liberals who dislike guns. The only thing they are doing is abandoning the California hunters who have and continue to support them. They are abandoning traditional game management by assuring less money to manage game here. They are assuring the maximum number of hunters will simply give up hunting in California, and probably entirely. The only ones who win in this game are the anti-hunters, and with thinner ranks it makes a total hunting ban far easier and more likely. I have friends who always ask me why I still live in California with all of the political insanity here. I always say that only cowards cut and run. I will not let the anti-hunters win in this state. I don’t care how much trouble it becomes or how much it costs. I will hunt in California. I will not let them win. Chief Sitting Bull said, “When the Buffalo are gone, we will hunt mice. For we are hunters and we want our freedom.” A contemporary paraphrase would be easy to write. But if it gets so bad that I have to use rocks collected on site, thrown by hand or hurled from a slingshot made with organic materials, I’ll hunt. I want to know who’s with me in this fight. So I’m publically asking all the ammunition companies if they are indeed going to cut and run, disserting California hunters in a critical time of need, or if they are going to step up to the plate and figure out a way to be here for us. DOVE OPENER SEPT. 1 DFW MUM: The Arizona Game and Fish Department has launched a major public information campaign about this year’s dove hunting season opener on Sept. 1 (Go to this link for the Arizona information: http://www.azgfd.gov/h_f/hunt-info/dove/dove.shtml). The big news is a new 15 bird limits (a 50 percent increase) and excellent hunting opportunity. California has the same limit and as good (maybe better) hunting opportunity, but apparently our Department of Fish and Wildlife (DFW) is intent on keeping this news a secret. First, news from Sacramento: SB 53, that horrific piece of legislation that would force all ammunition buyers to essentially go through a criminal booking process ñ thumb-printing, background check, pay a fine — I mean a registration fee, and have their name on a registry, is about to pass our goofy legislature. The bill would also ban all ammunition sales from mail order companies, essentially eliminating ammunition availability for old antiques and odd-ball guns in calibers not normally stocked by retail outlets. Thinking people can’t fathom the intent of the bill except to harass gun owners. Senator Kevin De Leon’s bill was amended slightly this week to exempt licensed hunters from the mail order ban. It was a ploy. With over six million gun owners in California and only about 250,000 of us who hunt in this state, this was a feeble effort for De Leon to get some hunting groups who opposed the bill to back off. Hunters and all other gun owners need to call their state Senators and plead with them not to pass this bill. It’s just bad legislation that discriminates against gun owners. FAST AND FURIOUS: You remember Fast and Furious, the Alcohol, Tobacco and Firearms’ (ATF) botched effort at gun tracking that morphed into a gun-running operation that armed Mexican drug cartels and has led to the death of hundreds of Mexican citizens and death of Border Patrol Agent Brian Terry. Well, the a judge this week demanded that Eric Holder’s Justice Department release a log of all withheld documents to the court. There is a belief these withheld documents contain information that AFT officials and members of the president’s staff knew of the operation and let it continue even when it became clear the AFF was losing track of the guns. Justice has until Oct. 1 to turn over the log, and eventually all the documents, so the public might finally know who was responsible for this illegal operation. I would be there will be another computer crash (like the one that ate the IRS documents) that will gobble up the log and all of the documents it lists. While there was a big splash in the news when an animal control officer in La Quinta rescued a young desert bighorn sheep ram from a canal last Sunday, there hasn’t been a peep about the death of another bighorn in canal in the same area this week since the rescue. But that’s hardly news these days. These rare desert sheep drown all the time in these canals. I was shown the skull of a huge ram that drowned in one of the area canals a couple of years ago, a sheep that would have brought over $100,000 in tag money if the sheep was killed legally by a hunter who bought an auction tag. Yet, no hands were even slapped over the needless death of this sheep, no fines collected, no citations written. The DFW refuses to demand that the golf course owners and canal operators fence the sheep off of the fairways (where they get diseases and die) and canals (where they drown) to protect them from the hazards. In fact — I’ll repeat this — they don’t even get fined for illegal take when one drowns or dies of disease. This is our DFW at its best. They will help implement a stupid statewide ban on lead ammunition for hunting on the off chance it might save a hawk or two from dying of lead poisoning. And “might” is an optimistic term because the reality is that the ban will have zero effect on any species’ population. But this is the same agency that won’t enforce regulations and laws that ban the take of eagles (by windmills and solar power) and bighorn sheep (by golf-course caused disease and drowning in canals). The agencies priorities are completely out of whack. There is good news and bad news on the dove hunting front for the coming 2014 season. First the good news: The Fish and Game Commission adopted the new 15-bird limit for mourning doves for this season. This is the new ìstandardî dove limit, according to the new U.S. Fish and Wildlife Serviceís framework for dove hunting seasons for the Western states. Of this limit, and in counties where whitewing doves may be taken, no more than 10 may be whitewings. If dove populations drop below a certain level, the ìrestrictiveî dove limit (10 birds) would be recommended, but dove populations have been very stable at a high level for the past decade. Best of all, the new, more accurate dove population surveys show hunter harvest has had no impact on total dove numbers. 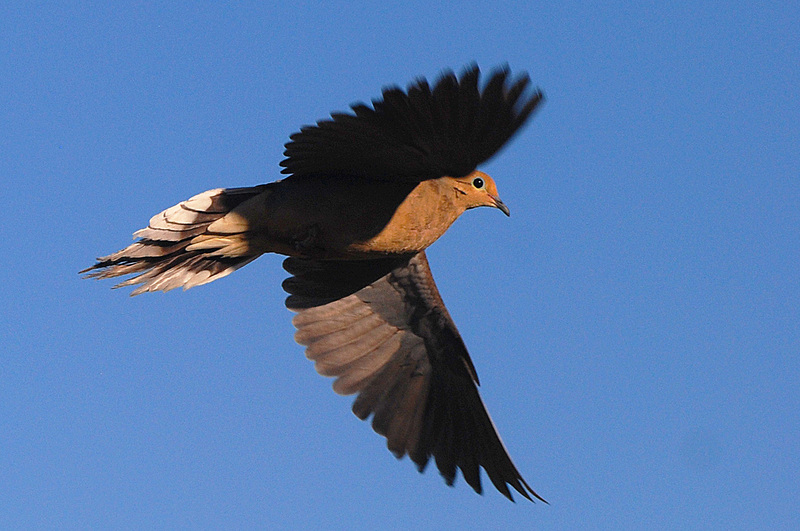 It has been decades since California had a 15-bird dove limit. Does anyone remember the last time? In addition, the Commission approved a year-around, no-limit season for Eurasian collared doves, a non-native species, whose population has exploded in this country. The no-limit, year-around season was tested in Imperial County last year and game wardens reported few problems with the program so it was expanded to statewide this year. Now, the bad news: One of the only positive programs implemented for Southern California hunters by the Department of Fish and Wildlife was bungled this year by the state agency. The Imperial County public land dove fields, a cooperative effort between Desert Wildlife Unlimited and the DFW staff at the Imperial Wildlife Area, are without three of its best fields on the Finney-Ramer Unit for 2014 (the Wheat Field, Game Farm Field, and Field 138 for those of you who know the area or have last yearís map) because DFW Sacramento refused to fund Imperial to prepare these wheat fields. While DWU received its funding, it was not able to prepare all of its fields and the state-owned lands. Everyone is saying the problem will be fixed by next year, but there is no reason for to have happened at all this year. A little background is in order. The vast majority of California hunters live in the southern half of the state. Yet, itís difficult to find too many programs ñ other than for doves and waterfowl on state-run areas or other public lands ñ that benefit sportsmen in this region. The DFW mismanages most its state-owned lands through restricted access or downright closures. It has a few permit-only hunts in areas that should be open to hunters throughout the hunting seasons. We donít do habitat programs. We donít have DFW staff building and maintaining desert water sources any longer. We donít even do annual game surveys. The trickle of dollars from DFW coffers back to this area as opposed to the river of money that flows north is embarrassing. And this year it is even less. So how do a few Sacramento bureaucrats decide to cut off the tiny amount of funding needing for an ongoing program that provides hundreds ñ no, thousands of hunters ñ a place to hunt birds? Those three wheat fields and adjoining areas provided excellent dove hunting in both the early and late season, Eurasian dove hunting year-around, and quail hunting during that season. Leon Lessica, the ramrod volunteer behind Desert Wildlife Unlimited which started the dove field program in the Imperial Valley, called those three fields the best ones in the valley. There are a lot of people outraged by this. But itís just one of so many areas where excellent programs are being strangled by the DFWís Sacramento bureaucrats. There could be an excellent dove field program at Camp Cady Wildlife Area (east of Barstow on the Mojave River), and there was for a couple of seasons. But then a pump at a well broke, and then an irrigation pivot, and there was no DFW money or staff to fix those things. So now, it is up to volunteers to fund and fix those things. But they have to get DFW approval for each step in the process and that takes longer than it does to do all the volunteer labor. So, now another year will go by without Imperial County-type dove fields at Camp Cady. But thatís just one of many things where the DFW is sitting on its hands. They always blame money and staffing and budget cuts. Yet, the DFW budget has gone up every year since I starting covering the agency in the early 1970s. During that same time frame, the number of hunters statewide has gone from 850,000 to around 250,000 ñ and those 250,000 of us who still buy licenses pay more than weíve ever paid to make sure the DFW gets those annual increases. Stupid us, we even lobbied for legislation to create an Upland Bird Hunting stamp (effectively charging ourselves even more money) so we could be sure some funding was reserved just for dove, quail, chukar, and other upland birds. A few years ago, I tried to find out where the Upland Bird Stamp money was being spent. It was a nightmare of delays and then bureaucratic slight-of-hand. In the end, there were two realities. First, existing upland game program were defunded and the ìnewî money used to backfill at a lower level. But even that would have been OK, if that money made into programs to help upland wildlife. But the reality was simply that more than half of it was being sucked up by bureaucracy in Sacramento, and then more piddled away in the regional office, until so little came back to the field as to be almost insignificant. There is less being spent on upland programs today than before the stamp law was passed. The Finney-Ramer wheat fields for doves were one of the few things down here that money actually funded. Will they be back next year? I wonder. Unfortunately, the DFW staff doesnít think about what projects would give them ñ no wildlife and sportsmen ñ the most long-term bang for the buck. If they did, habitat and water projects would be number one down here. They would contract someone to fix the Camp Cady pump and pivot and hire a farmer to do a couple of hundred acres for native bird forage. They would make both 10-year contracts renewed automatically. The agency would get credit for doing great things for High Desert bird hunters and wildlife watchers who would flock to the area. I have a huge list of projects like this. Best of all: The DFW would hire a pair of three-man crews (two people on each crew would be part-time seasonals that can be had cheaply) to do nothing but repair and built desert water sources to mitigate for all that has been lost to development, drought, and groundwater pumping. But I was flat told by the head of the Upland Stamp program, that water/habitat crews like those who built all the desert guzzlers in the 1950s and 1960s would never happen again. Never. Why? Well, itís not in the budget. Lead ammunition for hunting will be completely banned in California by 2019 under the guise of protecting wildlife from lead poisoning. The state Department of Fish and Wildlife (DFW) director, Charles Bonham, supported the legislation that mandated this ban. No scientist within the state agency would admit to supporting the ban because the science for the statewide ban remains non-existent. Now the drum to ban lead ammunition is beating in Oregon and the upper Midwest because of some surveys and more weak science. Some facts need to be pointed out. 1) With the exception of California condors, where the endangered population is so small that every death of a bird is critical, lead poisoning is NOT a factor in the decline of any species. None. Lead has been found in scavenging birds, even at lethal levels. But the number of birds poisoned to death is far less than other mortality factors and none of these bird populations are in decline (and most are showing steady increases since DDT was banned decades ago). Lead is not impacting golden eagles, not bald eagles, not crows and ravens, none of them. So there is NO science that suggests lead bullets or bullet fragments are harming any wildlife populations. None. 2) The cost factor is of non-lead ammunition over lead ammunition is routinely dismissed or ignored by those pressing for bans, including many in state and federal game agencies who get paid far more than the average hunter. Yet, for many hunters the difference between a $60 box of big game hunting ammunition and a bargain $15 box is significant. That $45 can mean be the difference of two hunting buddies being able to afford a tank of gas for an old truck to go on a hunting trip or not. All non-lead ammunition costs far more than lead by factors of four to six times. 3) In the entire range of condors in California, lead hunting ammunition has been banned since 2008 and the DFW says hunter compliance is nearly 100 percent. Yet, California condors continue to exhibit high levels of background lead in their blood and systems. Ironically, golden eagles in the non-lead zone have seen their background lead levels drop to zero. This suggests condors are getting lead from other sources, but no one is addressing that issue, especially in the media. If it was so critical that we ban lead ammunition in California, why did the legislature give the Fish and Game Commission until 2019 to phase in ban? Why? Because it’s not about science or any pressing wildlife need. It’s part of the political agenda to ban lead ammunition. And that agenda is spreading across the country like wild fire. In Oregon, the state university system and the state game agency have partnered up to survey hunters on lead ammunition, assuming lead is a bad thing. This is setting the stage for ban talks. In the upper Midwest, a really horrible scientific paper that examined bald eagle carcasses and bullet fragments in deer gut piles drew some conclusions that some management changes were in order. The paper did not and could not (with the data collected and other supporting scientific literature) draw any correlations between eagles that had high lead levels and the gut piles with lead. It was pure speculation, not science. It was filled with the words “might” and “may.” Yet, now the feds are parading around a presentation at public meetings around the region showing off the data so they can press for lead ammunition bans based on what I’m calling “bandwagon science.” The liberal environmentalists want something so we invent the science to support it. No one is looking at the California example, where our lead condor ban has done nothing for condors. And there’s no science to back up banning lead for any other species. Our legislators didn’t look at the California example before they banned lead here, why should other states? I don’t want to hear some whining liberal say, “but if you could save just one bald eagle by banningÖ.” That’s the same stupid argument people make about gun control. “If you could save one child’s lifeÖ.” Well, if you use that argument, you have to use it for the things you like, too. If you could save one drunk driver’s victim by banning wine (any or all alcoholic beverages)Ö. If you could save one tree squirrel in Crestline by making the speed limit three miles per hourÖ. If you could stop one high-speed teenage driving accident by putting 30 mile-per-hour speed limits on all roads (they wouldn’t drive over the speed limit, right?)Ö. Or, if we don’t trust people not to drive the speed limit, how about we put governor devices on all our cars that regulate our speed to 30 miles per hour. They would be safer and get better mileage. Oh no, you don’t want big brother to intrude when it’s your ox getting gored. But you’re more than happy to see lead ammunition banned for hunting because you don’t have the facts. But it’s not about the facts, is it? The Raahauge’s Shooting Sports Fair, the largest hands-on gun show in the nation, will be held Friday, May 30 through Sunday, June 1 at Mike Raahauge Shooting Enterprises in Corona. It is the only show of its kind in California where the guns on display can be fired and not just admired. The Shooting Sports Fair remains the first and largest hands-on gun show in the nation, starting in 1983 as the brain-child of the late Mike Raahauge, and it is the only event of its kind in California. Most major firearm manufacturers around the world have their latest guns here. The Sports Fair was cancelled in 2009 because of ammunition shortages like this year. But for the past two seasons, Turner’s Outdoorsman, the show’s main sponsor, and vendors have been able to get enough ammunition together to host the event. And that’s no small feat. It has been estimated that over a million rounds of rimfire, pistol, rifle and shotgun ammunition is fired over the three-day event. Firearm companies represented for 2014 include, Remington, Ruger, Savage, Marlin, Bushmaster, Mossberg, Howa, Springfield Armory, Smith & Wesson, Glock, Beretta, Colt, Para USA, Benelli, and many other smaller companies and imported guns. Sig-Sauer is a new addition for 2014. All of these companies will have many if not all of the products in their line-up (at least those legal in California) available to shoot. In addition to new firearms, the Living History Range has authentic historic firearms that can be shot. These guns include everything from an actual Gatling Gun and a Mountain Howitzer to a wide range of single shot and lever-action .45-70s right up through vintage WWI and WWII firearms like the M98 Mauser and the M1 Garand rifles. There will be a Cowboy Action shooting range, and at Firearm’s Training Associates, there’s a falling steel plate range where shooters can get instruction and information on concealed carry and home defense classes. And all that is just scratching the surface of the shooting opportunities at this year’s Shooting Sports Fair. But there is far more than just shooting. There is a comprehensive slate of seminars and exhibitions. Perhaps most notably, Michel & Associates, a law firm specializing in firearms issues, will be giving daily presentations on existing gun laws and the slate of potential restrictions currently in the state legislature all three days of the Fair. The firearms law seminars will join the usual slate of public land waterfowl hunting, public land upland bird hunting, big game hunting in Southern California, and the extremely popular predator hunting seminars. 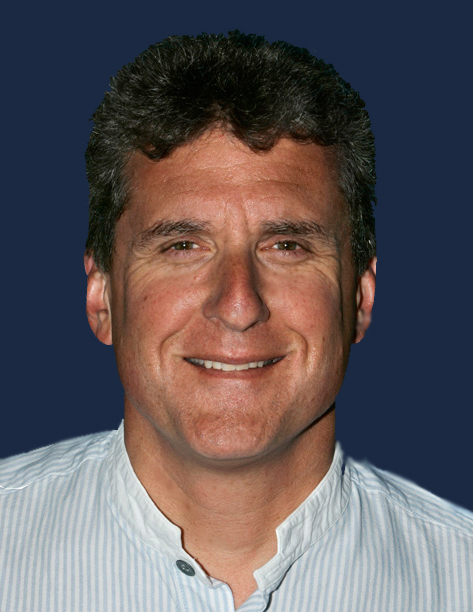 In addition, Paul Cacciatori of Starlight Kennels has been a fixture at the Sports Fair since its inception, and he will again be giving his demonstration on how simple and rewarding it is to train your dog to be a good field dog, focusing on discipline and retrieving. These seminars are always one of the most popular at the Fair and they are given all three days of the event. Joining Cacciatori for the first time this year with his own slate of dog exhibitions will be Linc Raahauge of Raahauge’s Hog Hunting showing off the talents of his trailing hog dogs. In a pair of demonstrations that illustrate the uncanning sighting and scenting ability of his Walkers and Black Mouth Curs, Raahauge will pit his dogs in the swimming race across one of the duck ponds and a trailing race that will have them follow a scent and then bay at a tree where the scent trail ends. The California Rifle and Pistol Association and the National Rifle Association are also on hand to provide information on the latest state and national gun control efforts. Most of the region’s sporting conservation groups — from Ducks Unlimited to Quail Forever – have booths where volunteers with these organizations talk about their work in this region. If you want to see and do everything, give yourself plenty of time — or plan on coming more than one day. The Shooting Sports Fair will be open from noon to 6 p.m. Friday, May 30, 10 a.m. to 6 p.m. Saturday, May 31, and 10 a.m. to 5 p.m. Sunday, June 1. Admission is $15 for adults and parking is $5 (and includes entry into a drawing for either a Howa Ranchland rifle and scope package in .22-250 or a new Cannon gun safe, both $700 values). For more information or directions, call Mike Raahauge Shooting Sports Enterprises at 951-735-7981 or go to www.raahauges.com. There is also information on the Turner’s Outdoorsman web site at www.turners.com. A $2 off coupon for admission is available at Raahauge’s and all Turner’s stores. It’s time for Fish and Game Commission president Michael Sutton to go. In an online web conference organized by the Humane Society of the United States (HSUS) about poaching, Sutton said this week that California’s wildlife faces other more serious threats. He then said that he believed legal, scientifically-managed hunting of wildlife may cause greater overall problems. The exact quote: “I actually believe legal hunting that’s not sustainable may be a more pervasive problem in California,” said Sutton, according to a story on KCET’s web site. Sutton is president of the Commission that sets hunting and fishing seasons annually, and it would be the Commission’s responsibility NOT to set any seasons that were NOT sustainable. So what is Sutton saying? Is he saying the Commission, which he heads up, has been violating its responsibility? Is he saying the Department of Fish and Game is providing the Commission with scientific data that is flawed to maintain hunting? Is he saying no hunting seasons are sustainable? Does he believe that legal hunting is causing problems for populations of wildlife? What proof does he have? Or was he simply pandering to the Humane Society, that believes all hunting is wrong and should be stopped? The truth is that DFW scientists have reams of scientific research and volumes of data, including annual environmental reports, documenting the value and sustainability of hunting seasons for all hunted species. Human hunters are no different than coyotes or hawks, except we have the foresight and data not to overharvest a species. So, this anti-hunting rant is simply Sutton’s off-base opinion. There is no science to back up this belief — in fact, the truth is that he’s blowing smoke when he makes unsupportable claims like that. So the fundamental question is simply this: How can someone who doesn’t believe in scientifically managed hunting programs head the Commission that sets these seasons each year? If he is so biased that he doesn’t believe the science, how can he be allowed to serve? It would be like having a homophobe who doesn’t believe that AIDS exists in charge of a statewide AIDS program. It would be like putting a vegan in charge of a Beef Nutrition Board. There’s a point where bias become a hindrance to doing the job. But there’s even more about Mike Sutton that has been swept under the table in the past and probably will be again. Sutton is again being charged with “conflict of interest” as a member of the Fish and Game Commission. The National Shooting Sports Foundation (NSSF) filed a complaint with Kamala Harris, the California attorney general, this past week. The NSSF complaint points out that Sutton is on the payroll of Audubon as one of its vice-presidents. Audubon co-sponsored last year’s AB 711, the statewide lead ammunition ban, and the Fish and Game Commission has been charged with implementing the legislation. “His employer lobbies the Commission on governmental decisions which he makes and/or participates in, contrary to the letter and spirit of California laws proscribing incompatible activities,” the complaint says. In 2009, Sutton was also accused of conflict of interest after taking part in the Marine Life Protection Act implementation while working as director of the Monterey Bay Aquarium’s Center for the Future of the Oceans. He was drawing a paycheck from the aquarium, which is funded largely by the David and Lucile Packard Foundation, which also funded the writing and passage of the MLPA legislation. This investigation was simply quashed and swept under the table, and Sutton voted solidly with the most extreme implementation of this law, needlessly (in that the rules were unsupported by science) impacting sport and commercial fishing. Well, duh, that is settled science. Then what was he saying during the webinar? He was simply saying what he believed? Well, he didn’t deny he made the statement so it’s pretty clear the follow-up letter was simply damage control. Sutton should be removed from the Commission immediately and sportsmen throughout the state should call their legislators and the Commission office (916-653-4899) and ask that he be removed. The very same thing happened to another Commissioner, Dan Richards, two years ago. Mountain lions are not legal game in California because of state law passed by Proposition (not scientifically determined by biologists), and it’s now the law here. However, hunting lions in other states is still allowed by their state laws (and managed by science instead of emotion). Dan Richards was removed from the Fish and Game Commission because he didn’t agree with California state law and hunted lions legally in Idaho. Then the same standard should apply to Sutton. It’s his right to say that hunting is wrong or believe the settled science is bogus, but hunting is legal under state law and scientifically managed. So if Sutton doesn’t agree with state law, he should be removed from the Commission just like Richards. No double standards. The conflict of interest charges are just bonus reasons to dump Sutton. So let’s call his statement against hunting a third strike and get rid of him from the Commission forever. In an agreement that will save San Bernardino County money and potentially improve public services at Lake Gregory, San Bernardino County Parks has entered into a contract with Urban Park Concessionaires (which also runs Diamond Valley marina) for the management of the popular lake in the San Bernardino Mountains. The new operators took over the day-to-day management of Lake Gregory and all the county facilities there beginning Jan. 1 this year. The agreement extends through Dec. 31, 2016 with an option to enter into a long-term lease agreement at that time. The company will manage and be responsible for the upkeep and maintenance of the park facilities, collect and retain all recreation and event fees, provide food and beverage concessions, and expand services and events available for the public. In return, the county will pay $550,000 over the first two years of the agreement for “management fees.” In the final year of the contract, the county will receive 10 percent of all revenue or $100,000, whichever is greater. This revenue sharing portion of the agreement is expected to continue into the future after Urban Park Concessionaires signs a long-term agreement after 2016. It cost the county just under $1 million to operate the facilities at Lake Gregory during the last fiscal year and revenue was $550,000. In the two previous years, costs were over $1 million and revenue was even less. The new concessionaire promises to enhance the fish program like it has at Diamond Valley Lake with an enhanced fishing and stocking program. There is an open house Monday, February 17, at the San Mortiz Lodge at Lake Gregory when the concessionaire will announce its plans for Lake Gregory. No fee increases are expected, at least initially, because the fees are set by the county Board of Supervisors. A new Quail Forever Chapter has formed in the southern San Joaquin Valley with a stated mission of repairing small game guzzlers and other water sources throughout the region. The primary focus will be in the Temblor and Caliente mountain ranges that line the Carrizo Plain. There were a pair of formation meetings Jan. 28 and 30 in Bakersfield and the fledgling group delivered 650 gallons of water to a pair of guzzlers in the Carrizo region this past weekend. That’s hitting the ground running! The next meeting of the new South Valley Chapter of Quail Forever will be 7 p.m. Thursday, February 20 at the Sugarmill Restaurant on Chester Ave., Bakersfield. If you need more information or want to be involved but can’t make the meeting, contact Rusty Stone at 661-549-3359 or via e-mail at rustylstone@yahoo.com. Please let your hunting buddies in this area know about the new club. To help get membership, the club is offering copies of a special issue of the Western Birds hunting newsletter with the locations of all the guzzlers in this area. Everyone who joins the new club will get a copy.